Immigration is one of the most hotly debated topics today. But, the question involves more than politics and emotion; it includes such critical issues as law, justice, human rights, human dignity, and freedom. Strangers in This World is a collection that brings together an international consortium of scholars to reflect on the religious, political, anthropological, and social realities of immigration through the prism of the historical and theological resources, insights, and practices across an array of religious traditions. 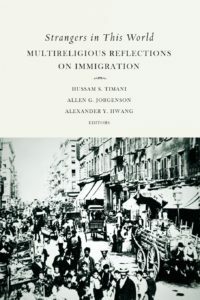 The volume, reflecting the diversity of religious cultures, is nevertheless unified in arguing that immigration is an important aspect of the major religions and is found at their core. The contributors unfold this important dimension of the religious traditions and explore the ways that the theme of immigration connects to vital points of theological reflection and practice in Hinduism, Buddhism, Judaism, Christianity, Islam, and Native American religious traditions. At root, the volume is about our collective journey together as immigrant peoples who have stories and settlements to share, as well as challenges and struggles to overcome, that may be faced through the resources our many faiths offer.